Finally! I’ve found a few simple products that are giving me a consistent look. Consistency is key in my line of business but some naturalistas warned me in advance, some days you won’t know how your hair will turn out until it doesn’t turn out right. 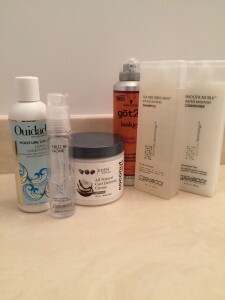 They also told me it would take a lot of patience and money before I found the products that work best for my hair. I’m still learning A LOT about natural hair. My hair has her own personality and some days, she’s just not in the mood to cooperate. She reminds me of me. But for the past two weeks, her curls have been poppin’ like Lil Mama’s lipgloss . Giovanni Tea Tree Triple Threat Shampoo and Smooth as Silk Deeper Moisture Conditioner: LOVE LOVE LOVE the Giovanni line! I discovered these products by researching what other natural women were saying online about their favorite shampoos and conditioners. If I need a quick hair wash during the week, I still use my As I Am Cowash, but my hair responds really well to the Giovanni tea tree shampoo and it gives my scalp a nice tingly feeling. I found it for about $7 a bottle at Vitamin Shoppe. Talk about a deal! Ouidad Moisture Lock Leave-In Conditioner: People swear by this leave-in conditioner in the online reviews I read so I had to give it a try! I bought it at Ulta. It’s not cheap: $26. But I do like it. It doesn’t leave any residue, it’s not sticky and a little goes a long way. Eden BodyWorks Coconut Shea Curl Defining Creme: A round of applause for this product! It brings out my curls almost immediately and I can use it on my dry hair before I do my flexi rod set. It has a pleasant smell, it’s moisturizing and not greasy. LOVE! You can find it at Target, Sally’s Beauty Supply or Walmart. Giovanni Frizz be Gone hair serum: Yes, another favorite from Giovanni! This is a lifesaver! I cannot sit on television with frizzy hair, especially not in high definition. I do not go to work without this product! I use it to separate my curls, especially after a flexi rod set. This lightweight product does not weigh down your hair or leave it looking greasy. It’s awesome! Again, I bought this product at Vitamin Shoppe for about $8. got2bKinkier Curling Mousse: I’ve recently discovered this mousse and I’m hooked. It works great for my flexi rod sets. And did I mention it’s less than $5? I found it at Walmart. I’ve also tried the Jane Carter Wrap & Roll setting foam. It leaves the hair soft but doesn’t instigate my curls like the got2b Kinkier mousse.